Happy Saturday everyone!! For the next 4 weeks, myself and 14 other bloggers are joining together for a Clean Eating Challenge 2014. We will be here each Saturday with delicious, healthy meals, desserts, and snack recipes that your family will love. 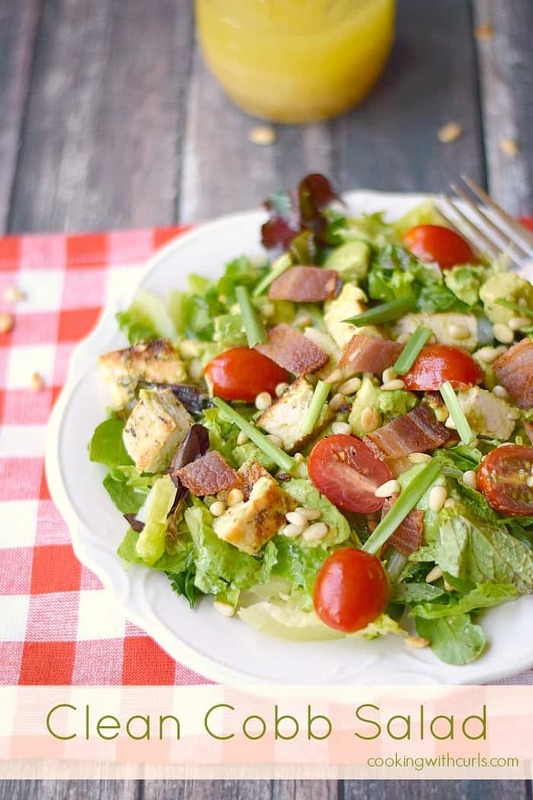 My first recipe for this challenge, is a Clean Cobb Salad. This salad still maintains all of the delicious flavors found in the original classic, but is much healthier. So what exactly is Clean Eating? Clean Eating according to Clean Eating Magazine is ” food in its most natural state, or as close to it as possible. It is not a diet; it’s a lifestyle approach to food and its preparation, leading to an improved life”. Any food with crazy, chemical sounding names, is not clean and therefore not healthy. I am severely allergic to mold, so there is no Roquefort cheese on my salad. I have included it in the recipe as an option, or eliminate it for a paleo/whole30 salad…..I am all about the options! 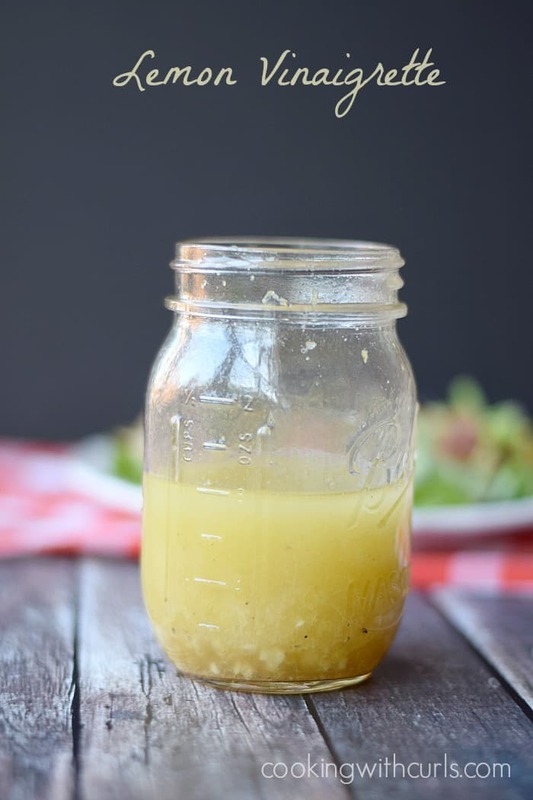 The first thing you want to do, is make the Lemon Vinaigrette. Place all of the ingredients in a jar with a lid and shake vigorously to combine, or you can whisk them together in a bowl…..
Set the dressing aside to mingle and get happy. 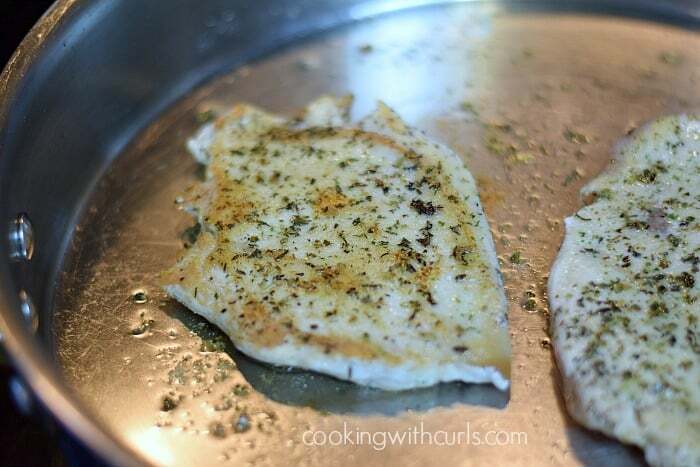 Place chicken breasts between two sheets of plastic wrap and pound until even….. I always do this before cooking chicken. It helps the chicken cook more evenly. Season chicken with garlic powder, onion powder, and Herbs de Provence. Heat oil in a large skillet, and cook chicken until no longer pink…..
You could also grill the chicken during good weather! 🙂 Allow chicken to rest, then cut into bite sized pieces. In a large bowl, combine the lettuce, parsley, and mint. 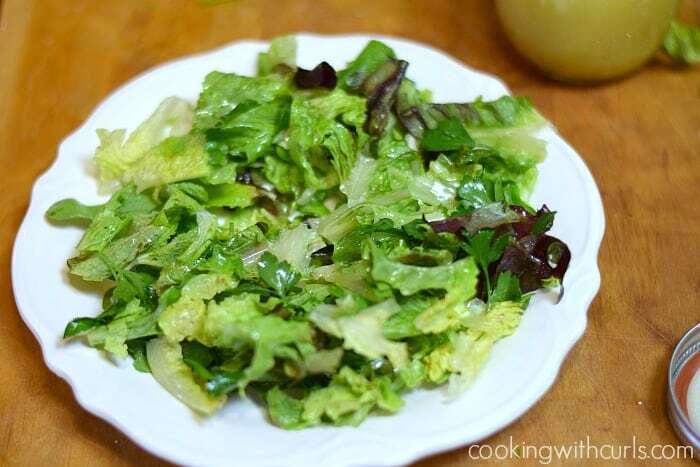 Toss with 2 Tablespoons of the vinaigrette….. Season with salt and pepper, and toss again. I used red and green Boston lettuces in case you were wondering why they are different colors. Divide the salad, and place on 4 plates….. 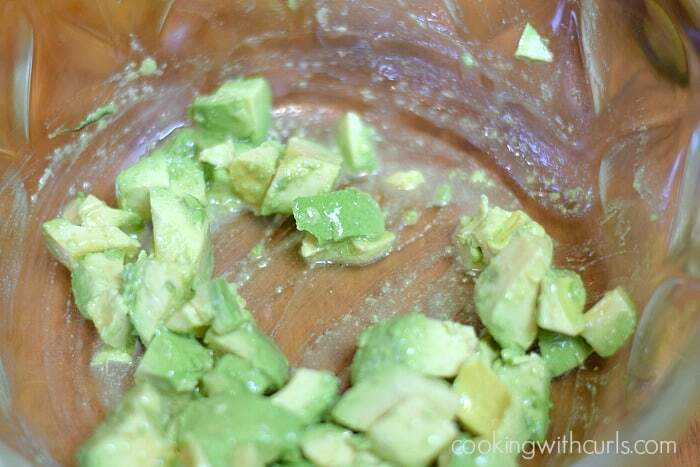 Dice the avocados and place them in a medium sized bowl. Toss with 1 Tablespoon of vinaigrette…..
Add the chicken, tomatoes, pine nuts, and cheese (if using), additional Tablespoon or two of vinaigrette, and toss to combine. Divide mixture and place on plated salad. Sprinkle with bacon and chives and serve….. 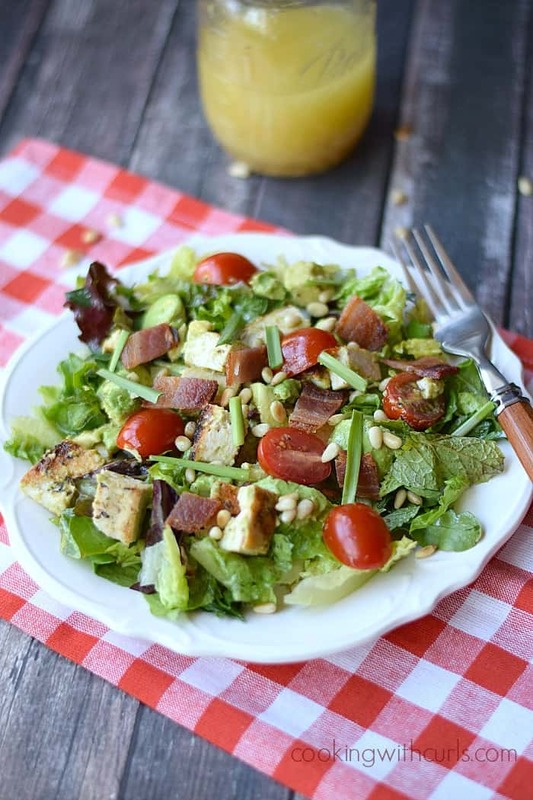 This Clean Cobb Salad is a healthier version of an old classic! Mix all ingredients together with a whisk, or shake vigorously to combine. Set aside. 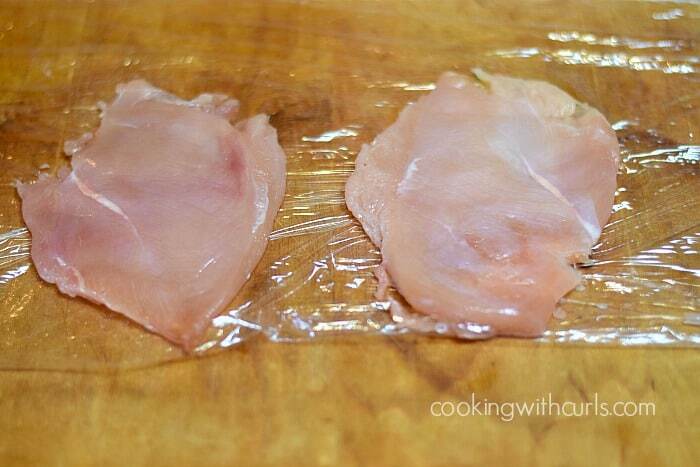 Place chicken between two sheets of plastic wrap and pound until even. Sprinkle with Herbs de Provence, garlic powder, and onion powder. Heat olive oil in a large skillet. Cook chicken until no longer pink, and set aside. 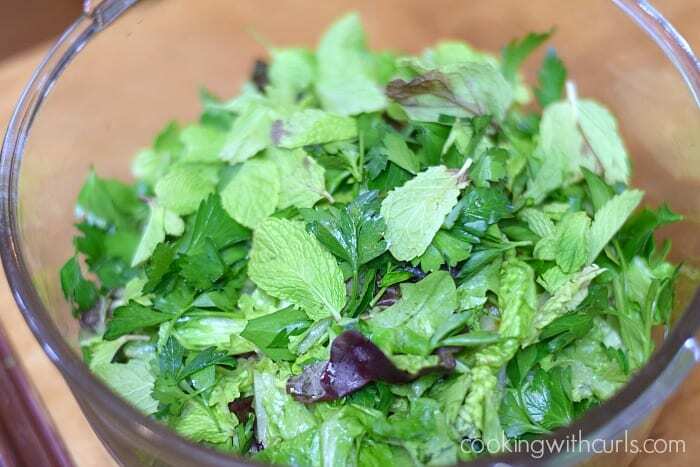 In a large bowl, mix together lettuce, parsley, and mint. Toss with 4 Tablespoons of Lemon Vinaigrette. Season with salt and pepper, and toss again. Divide salad mixture and arrange on four large plates. In a medium sized bowl, toss diced avocado with 1 Tablespoon of lemon vinaigrette. Add the chicken, tomatoes, and pine nuts and toss with an additional Tablespoon of Vinaigrette. Divide mixture and arrange in the center of the lettuce mixture. 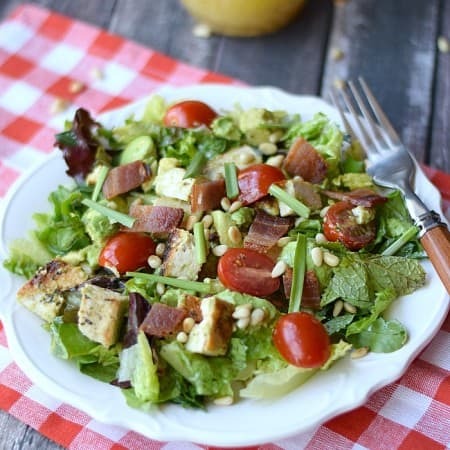 Sprinkle each salad with bacon and chives, and serve. You will not use all of the Lemon Vinaigrette. Store leftover dressing in a sealed container in the refrigerator for up to 5 days. Love this salad Lisa! It looks so fresh and you KNOW I love the dressing 🙂 I need to eat better so I’ll be looking forward to your recipes… pinning! Nice to meet you via Zainab. I like the clean eating challenge. Plus avocado and bacon in your salad is just yummmm. This series comes at a great time for me! My doctor tells me I am “this close” to being considered diabetic, but that I can forestall that by making some changes in the way I eat. I will be following with interest. I just had the same conversation with my doctor LuAnn. My blog will be moving more and more in this direction permanently…I refuse to take medications!! I love this clean eating challenge, Lisa! And I look forward to seeing what recipes you come up with ;). This one looks fabulous! You doesn’t like a healthy cobb salad? Ooo this is a fun challenge, Lisa. I love it! This salad looks great. I need to eat this for every meal this week after the way I ate this weekend. Ha, I feel like I am going to explode right now. Sugar overdrive and I have been really cutting way back on sugar. Guess I gotta pay for it now! Pinned to one of my group boards. Have a great week, Lisa! Thanks so much Julie. 🙂 It is a great challenge, the next one will be to keep it up when it’s over!! I hope you have a great week as well! Love love love this Lisa! The past couple of months you have seriously inspired me, loving your clean eating and paleo recipes! Keep up the UNBELIEVABLE work. The pictures are amazing!!!! Pinned and stumbled! This looks great! I have been “eating clean” again since January. Well I do 80% of the time. I do allow a cheat day a week. 🙂 It makes you feel SO much better! !